Speaking at the Code Conference on Wednesday, Apple executive Eddy Cue revealed that Beats Music for both Android and Windows Phone will continue to exist. That's a significant change for Apple, as the company has historically discontinued applications on competing platforms following an acquisition. "It's on Android now, and we want to keep it that way," Cue said. By keeping the popular Beats brand alive, Apple has found a way to give itself a presence on competing platforms —and sell music subscriptions to even more users —without directly using the Apple name. Keeping Beats Music on competing platforms also lessens the chance of federal scrutiny of the acquisition, which is expected to close later this year. Apple is already under sanctions from the U.S. government for its iBooks service following its defeat in a federal antitrust case. Interestingly, the official Beats Music website only showcases the application running on an iPhone 5s, with no signs of any Android or Windows Phone devices. 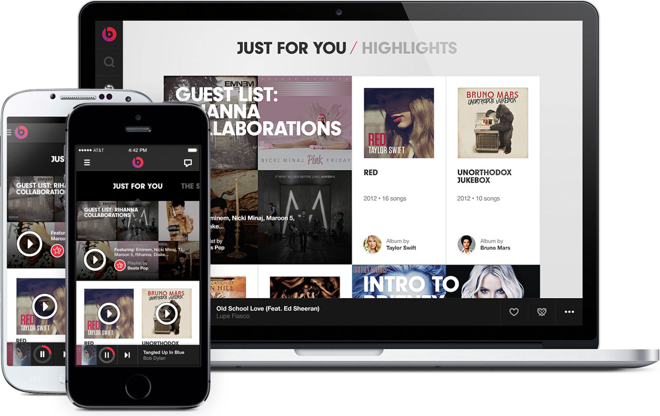 Rumors first surfaced in March claiming that Apple was in talks with record labels about launching an on-demand music service. In hindsight, it would appear that Apple held those apparent talks in anticipation of acquiring Beats Music, which is a Spotify-like service that allows unlimited on-demand music streaming for $99.99 per year. The same report from Billboard suggested that Apple was considering an iTunes application for Android. 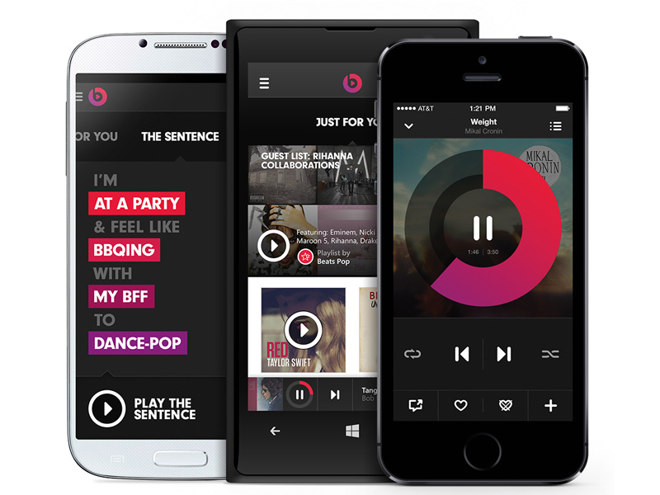 Whether that's actually in the works remains to be seen, but the existence of Beats on Android and Windows Phone will still stand as the first Apple-owned applications written for third-party modern smartphone platforms. Apple, of course, has dabbled in others' platforms before, most prominently with iTunes for Windows PCs. But that came at a time when Apple was pushing its iPod media players, which required syncing with a desktop in order to transfer music. Presumably, Apple will also keep the Beats application for Microsoft's Windows 8 alive as well. iTunes remains a desktop-only affair, incompatible with Microsoft's tile-based "Metro" interface. DRM-free music purchased through Apple's iTunes Store can be listened to on Android and Windows Phone handsets if the files are manually synced, but the iTunes application itself does not support syncing. And direct downloads from the iTunes Store to smartphones or tablets are only available on iPhones and iPads. Similarly, Apple's iTunes Radio service can be streamed to iPhone, iPad, and even Apple TV. And iTunes Radio is also included in iTunes for Mac and Windows, but the service cannot be accessed from an Android device or Windows Phone. Late Apple co-founder Steve Jobs talked about the prospect of iTunes for Android with biographer Walter Isaacson before he passed away in 2011. Jobs admitted that Apple considered bringing iTunes to Google's mobile platform, but ultimately decided it wasn't a wise decision. "We put iTunes on Windows in order to sell more iPods," Jobs said. "But I don't see an advantage of putting our own music app on Android, except to make Android users happy. And I don't want to make Android users happy."